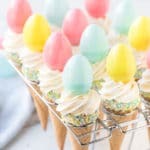 Home » Desserts (Baked) » Ice Cream Cone Cupcakes for Easter! 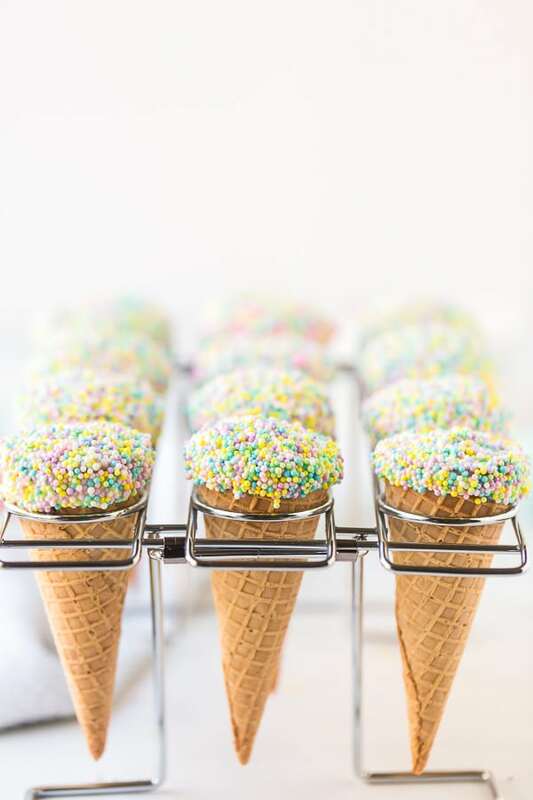 Ice Cream Cone Cupcakes are a fun surprise and make any day feel like a party! This Easter version is dipped in sprinkles and has a candy filled egg on top! 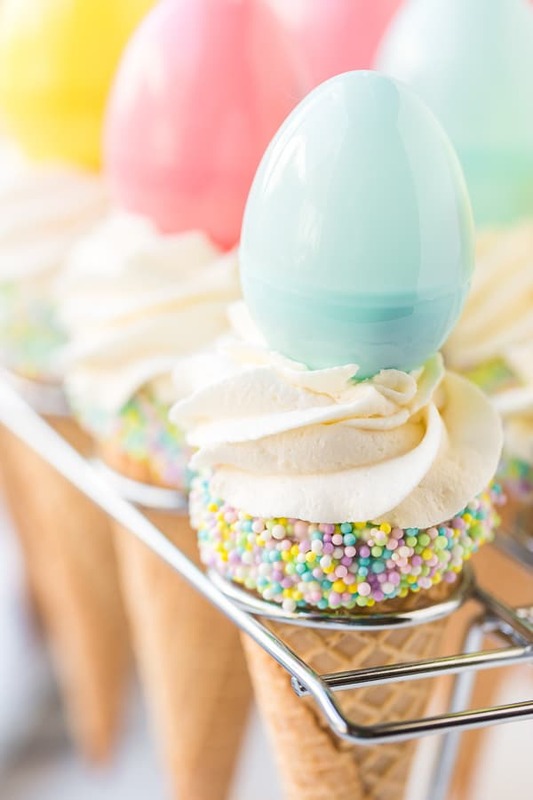 The surprise of realizing these Easter cupcakes are actually ice cream cones filled with baked cake and topped in such a whimsical way is always a delight for all ages. 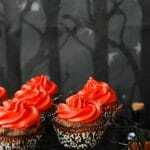 The cupcakes are not difficult but take multiple steps to complete. They are worth the time for the end result! What are Ice Cream Cone Cupcakes? They are cupcakes baked right in an ice cream cone! 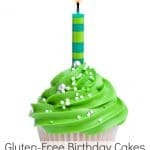 The cupcakes can be made from any cake mix (these are Funfetti) and a regular or gluten-free cake mix. 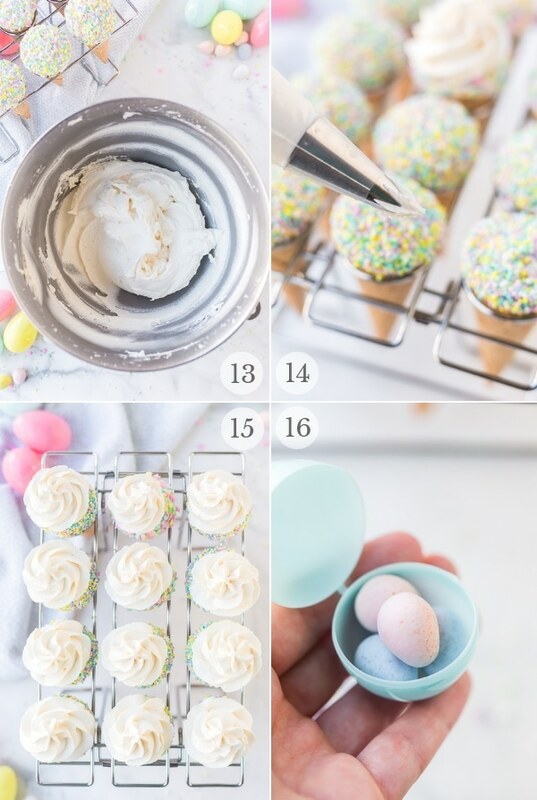 These Easter cupcakes are made with Funfetti cake mix. A special tool makes creating ice cream cone cupcakes a cinch. All ingredients are easy to find with notes about some of the specific ingredients (candy melts and ice cream cones) detailed in sections below! Most of the equipment required for these Easter cupcakes are regular things already in your kitchen. 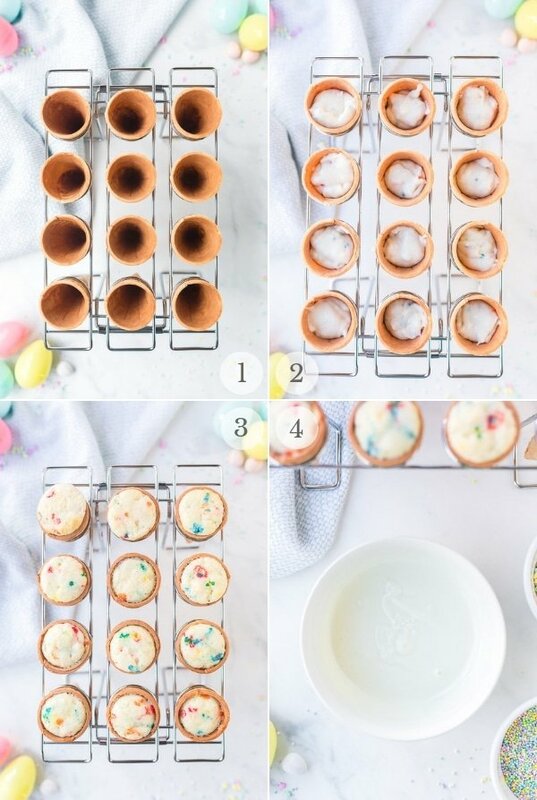 Using a cone baking rack makes everything with ice cream cone cupcakes easy. There are many options though I used a Wilton Cupcake Cones Baking Rack. It collapses for easy storage and is used to bake, decorate and hold the ice cream cone cupcakes. It’s affordable and worth the investment to make these and other ice cream cone cupcakes. 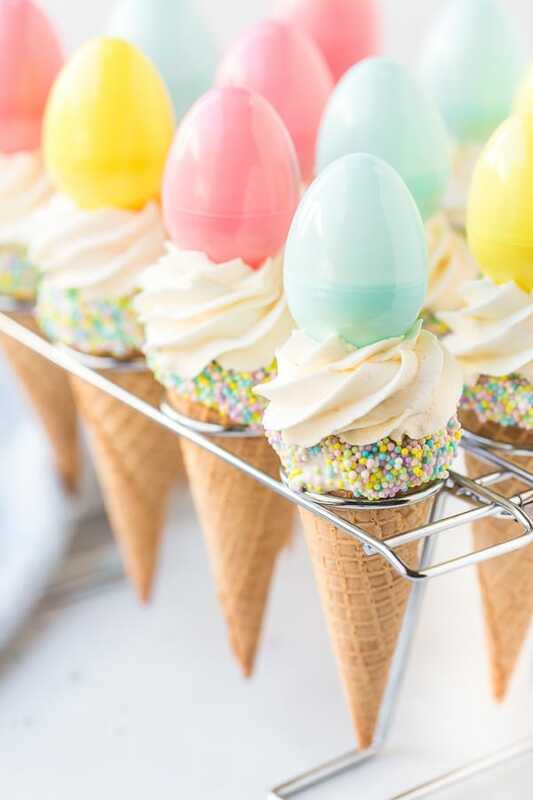 Frosting the top of the dipped ice cream cone cupcakes is easy and makes the perfect spot for a filled egg to rest. A 1M Wilton Frosting Tip and piping bag are needed for this step. These supplies are inexpensive and can be found online or in any stores with a baking section. If you need some guidance this video should help! 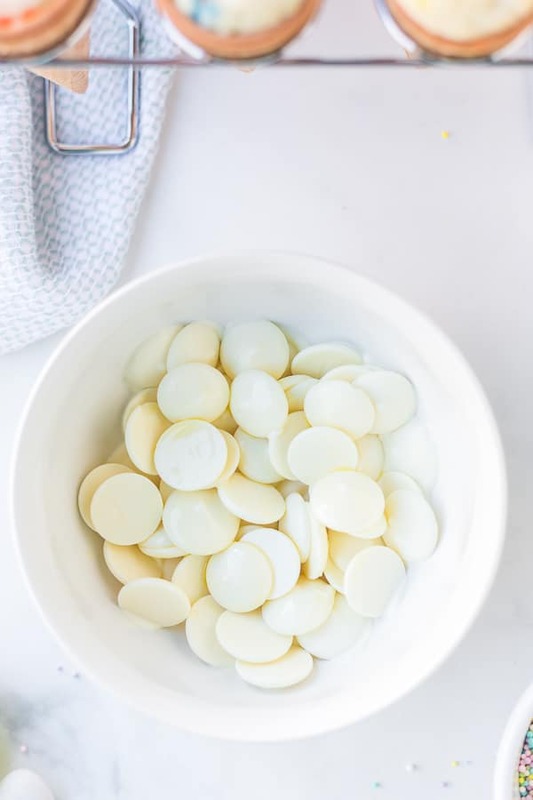 If you have not used candy melts in desserts, they look like flatter, larger chocolate chips. 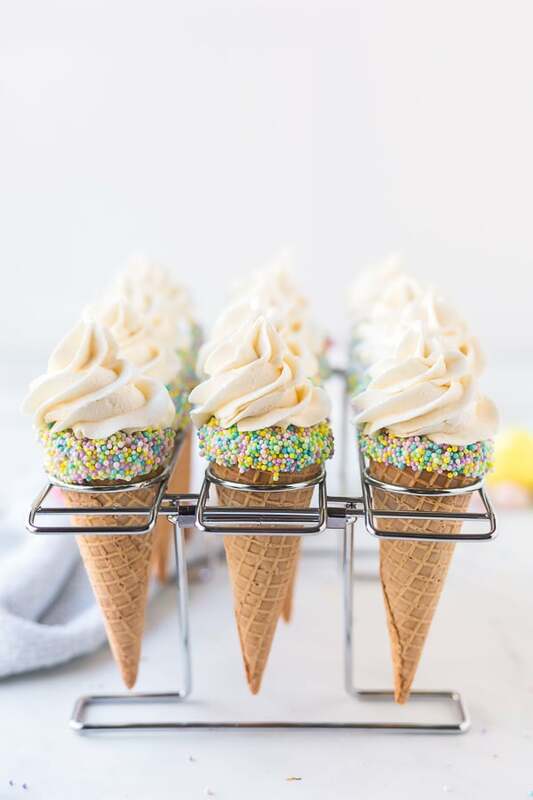 They melt to a creamy consistency making them perfect for dipping these ice cream cone cupcakes as well as for flavoring the vanilla frosting. The one catch is all brands are not created equal for taste. Candy Melts can taste a bit waxy. I used Ghirardelli White Melting Wafers which melt well and have a wonderful rich flavor. Guittard is another high-quality brand. There are many vanilla candy melts options to try. They can be found online or in crafting and kitchen stores with a baking area. This recipe has been tested with both gluten and gluten-free cake mix and cones. Both work great. For gluten-free cones I like Goldbaum’s Sugar Cones though any sugar cones will work. Goldbaum’s have great flavor and crunch, as well as are sturdy cones. Normally I order everything I can from Amazon to be delivered to my doorstep, however for these cones in particular I found the price there to be four times higher and many reviews of poor packaging and the cones arriving broken. They are usually available at Target and Walmart stores for a few dollars a package. Gluten-free ice cream cones can be a bit smaller than regular ice cream cones but still fit in the cone holder. TIP: check the fit of your cone in the cone baking rack before dipping them. If the cone sits low in the holder (not much sticking up over the holder), over dipping the cone cupcake can cause them to affix to the holder when the dipped surface hardens. Don’t let the length of this recipe scare you! Even though there are many steps, they are all easy and broken down with photos and simple instructions. Please refer to the recipe card for all the specifics of the recipe. Bake 16-18 minutes, or until toothpick comes out clean. Dip the top of cones in melted candy one by one. (photo 5 and 6) Do not dip past the top area of the cone (see photos). 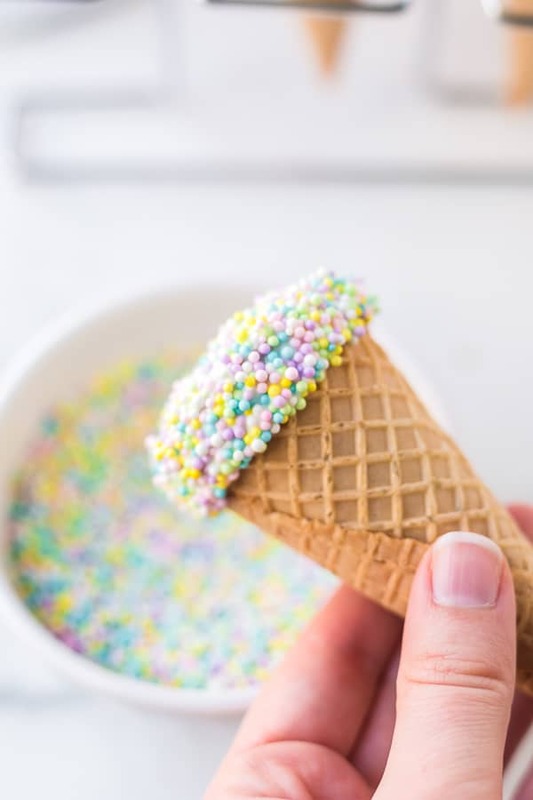 After all of the cones have been dipped in melted candy, begin dipping cones in sprinkles (this allows the melted candy to set first) (photo 8). Place in the cone holder to set up (see below). Fill clean plastic Easter eggs with desired candy (photo 16). 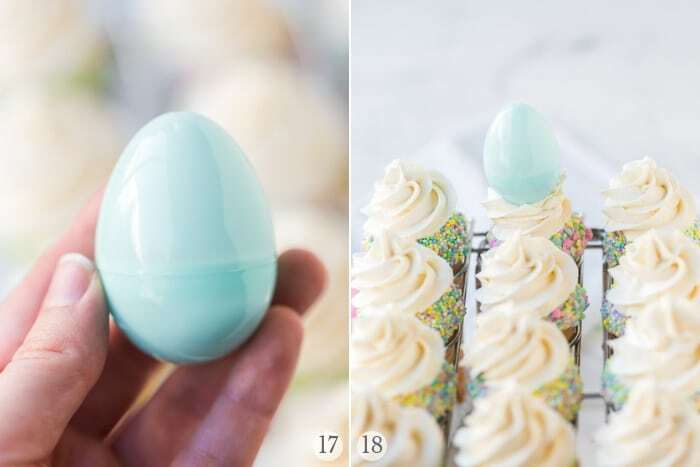 Add the filled egg (photo 17) to the top of the ice cream cone cupcakes (photo 18). Don’t overfill cones or they will overflow down the cone when baking. Don’t rush the cooling process. When the cupcakes are comfortable to handle they can be dipped. Dip each of the cone cupcakes THEN roll each in sprinkles. This allows the melted candy to set. Make the frosting AFTER all cones are dipped and sprinkles added; this allows setting up. Do not fill the plastic Easter eggs with heavy candies or more than half full so they stay in place on top of the cupcakes. 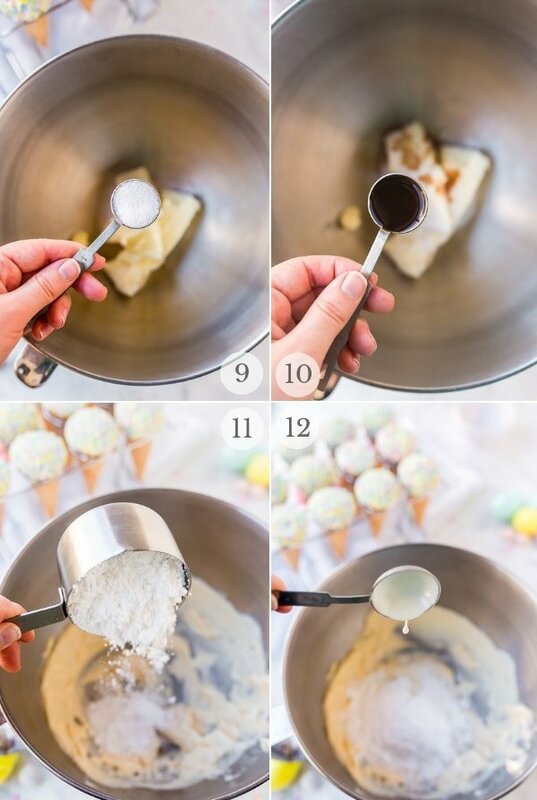 This ice cream cone cupcake recipe will make 12 cone cupcakes and use about ¼-1/3 the batter. What to do with the leftover batter? Increase the cupcake recipe to make more than 12 cupcakes. Increase the number of ice cream cones, dipping candy melt quantity and the sprinkles proportionately to the additional cupcakes (e.g. if you’ll make 24, double the cones, candy melts for dipping and sprinkles). The frosting makes a large batch and could be stretched over 24 cupcakes but would also need to be increased for more than that. Bake a smaller size cake using a 6-inch pan if you have one or in a single layer cake pan. 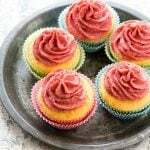 Bake some regular cupcakes to also enjoy or freeze for later. The Easter cupcakes can be kept at room temperature unless it’s very hot and humid. Store and serve them in the cone cupcake rack. Please SUBSCRIBE and FOLLOW ME on FACEBOOK , TWITTER , INSTAGRAM and PINTEREST! 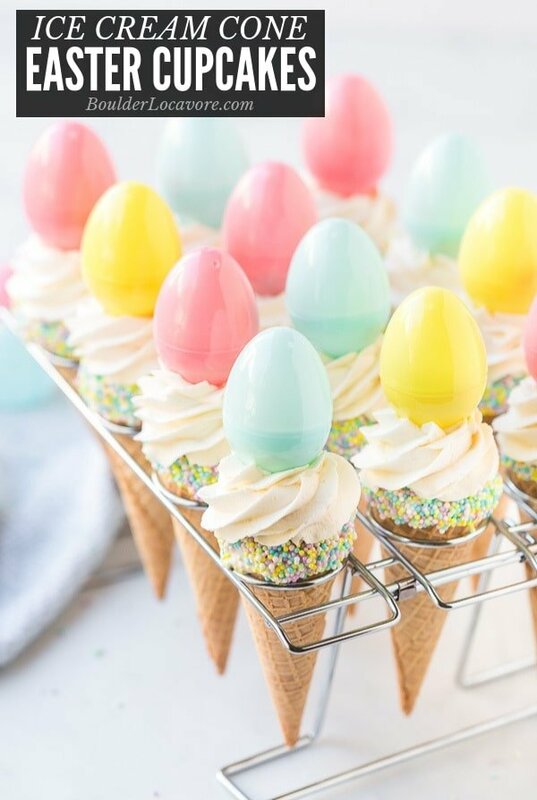 Adorable cupcakes baked in ice cream cones dipped in sprinkles with candy filled eggs on top are always an Easter favorite. Place a cone holder on a rimmed baking sheet and preheat the oven to 350 degrees. Spoon batter into the cones filling them 2/3’s full and place in the cone holder. While the cupcakes cool, melt the 1 cup of candy melts according to package instructions. Dip the top of cones in melted candy one by one. Do not dip passed the top area of the cone (see photos). This will ensure they do not stick to the cone rack if they are smaller cones. Place back into the cone holder. Repeat until all cones have been dipped. Once all of the cones have been dipped in melted candy, begin dipping cones in sprinkles one by one. Replace in the cone holder to set up. The bowl of a standing mixer equipped with the whisk attachment, cream together butter, salt, and vanilla. Add 2 cups of powdered sugar and 2 Tbs cream; beat until combined. Scrape the mixing bowl as needed and add the rest of powdered sugar. Mix until combined. Turn mixer on low speed and pour in the ¾ cups melted vanilla candy. Add the additional cream as needed for the consistency. When frosting is a smooth, thick consistency, whip frosting on high for 5 minutes. Frosting should be soft and fluffy. Using a 1M Wilton frosting tip, fill piping bag and frost cones in a circular motion. Fill clean plastic Easter eggs with desired candy and top. Note: do not fill more than half full (see Notes below). A standing mixer is preferred for making the frosting, but not required. 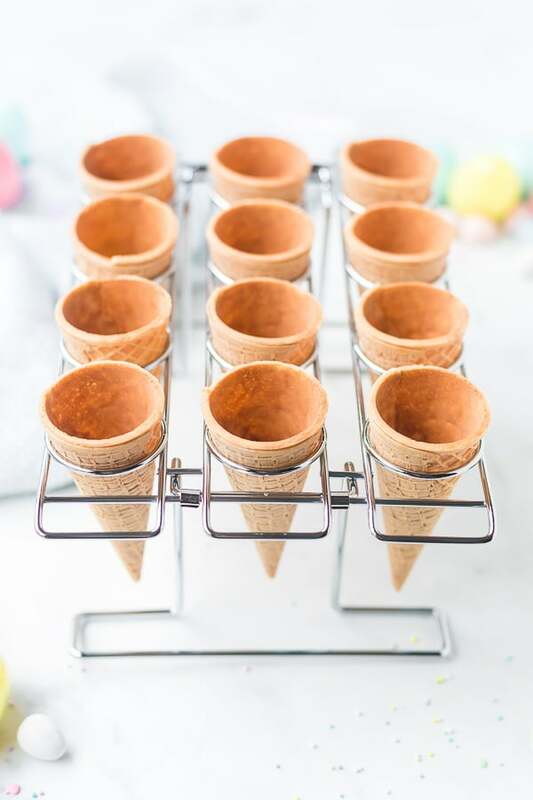 An Ice Cream Cone Baking Rack is used for this recipe for baking, cooling, decorating and cooling. Do not overfill the ice cream cones with batter. They can spill over in the oven and will not be as easy to dip and frost. 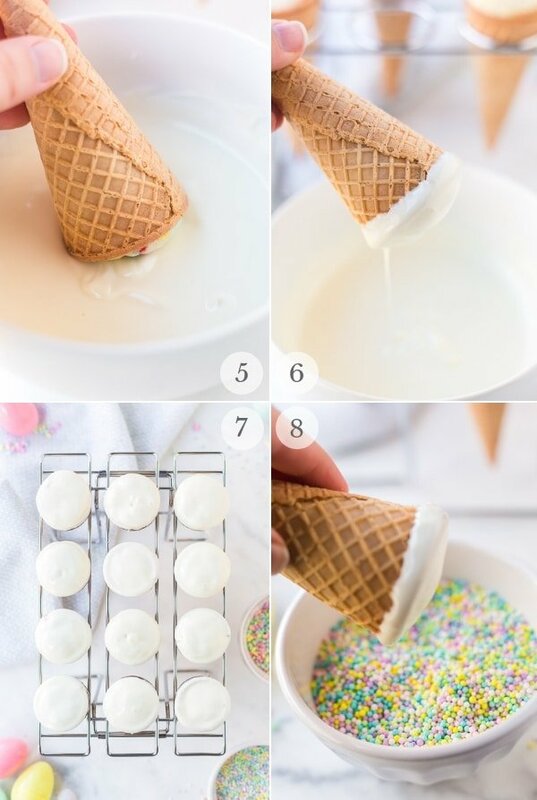 To make the sprinkle process easier, dip all of the cones in the melted candy one by one, and then then dip them in sprinkles. This allows the melted candy to harden enough to be turned upside down and dipped in the sprinkles. If you don’t wait, there will be a gooey mess! Do not to overfill the Easter eggs. If they are too heavy, they may slide off of the frosting. I recommend filling half of a side of a clean plastic Easter egg. Candy Melts: 1 10-ounce package will cover the needed amount for the dipping and frosting. What a wonderful Easter idea! 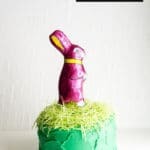 I would like to make these for Easter with my kid! I think these look so good. I love sugar cones and I love cupcakes! Toni, this is the most adorable recipe I’ve ever seen. I can’t decide whether to borrow some 9-year olds to help me make these or just eat a whole batch myself! What a great idea. These turned out really good! I would love to make them with my girls. They’re going to love this. I don’t know how anyone has the patience to make fancy cones like this. I would be too tempted to stop making and start eating! They actually are pretty easy and each stage pretty quick! It’s worth the wait. How adorable are these? I think they are bound to be a Easter party hit. They sound so tasty! These cones are so pretty! 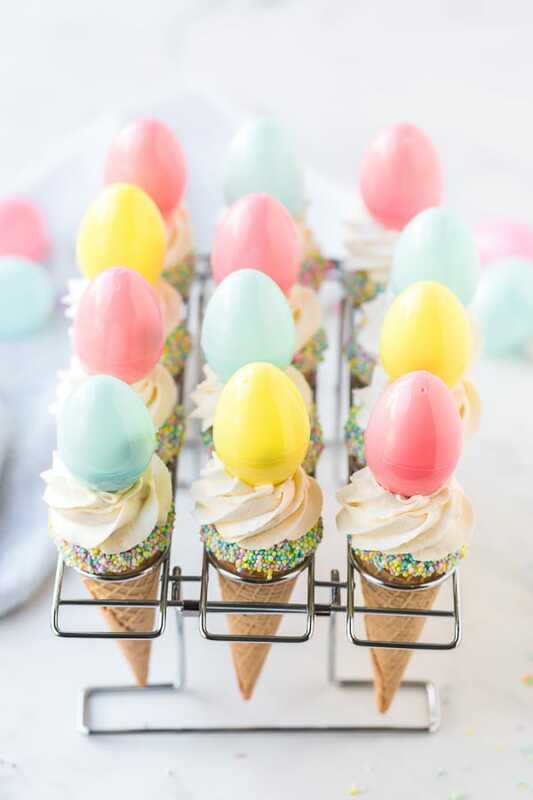 We have dipped cones in candy before but have never tried to style them with Easter Eggs–too cute! I LOVE THESE!!! So cute and so perfect for any Easter celebration! They would be a great idea for Birthdays too!!! I’ve made ice cream cone cupcakes before, but never this beautifully. 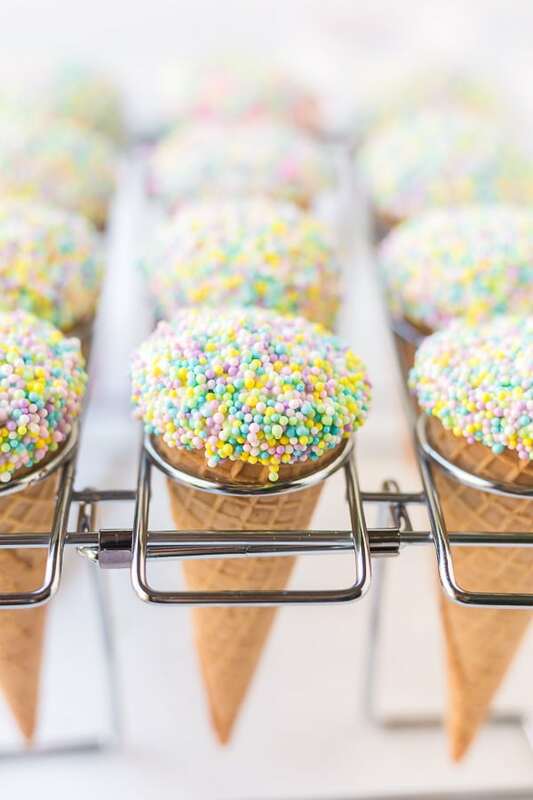 I love the idea of ice cream cone cupcakes for Easter, these will be for sure a hit. Those are just too cute and perfect for Easter! I had no idea there was such a thing as an ice cream cone baking rack… and bonus! It’s perfect for serving/displaying them too! Oh my goodness, these are just so adorable! I think I’ll have to make these for my Easter Egg (pysanky) decorating party this weekend. The kids will love them. I can see our family making these for Easter! What a delicious-looking treat, and the kids will think they’re cool. These would be great for a birthday party too! These are ADORABLE! I can’t wait to make these for my kids. Almost too cute to eat!! These ice cream cone cupcakes are absolutely precious. My girls are going to love to help make and share these with their friends. These are excellent treats for Easter. I look forward to making these with the family to share with their cousins Easter Sunday. My mom used to ice cream cone cupcakes for us, and they always felt like a special treat. Your easter version is adorable, I can’t wait to try it. Perfect Easter treats!!! My kids are too big for Easter egg hunts, but these will give them their sugar fix! Plus they’re so darn cute. I think this might be the cutest ice cream creation I’ve ever seen. I love this so much! 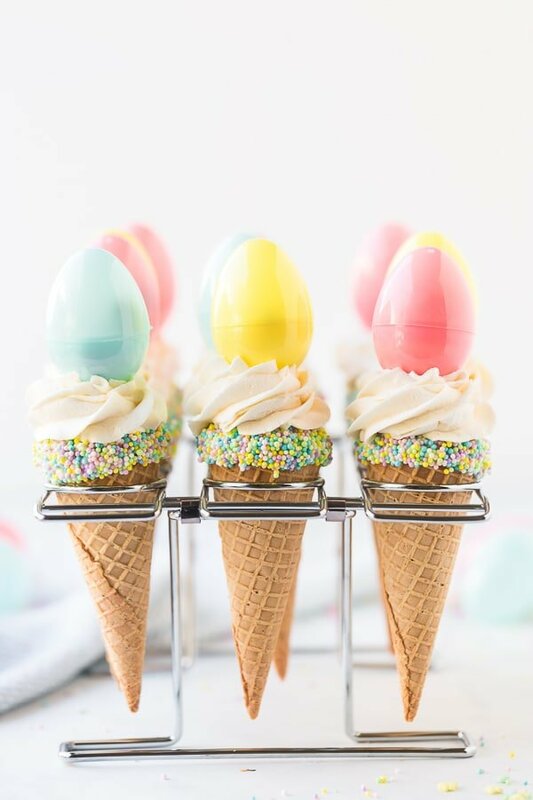 It has the perfect Easter vibe, and ice cream cones make everything better! They look so colorful & enticing. Would love to have a go right away if I could. I need to get some piping bags and tips. I love this idea, they are so cute and such a fun way to serve cupcakes! Plus, they look really portable too!